In our last blog post , we described trusts in general terms. This blog post will define and describe particular specialized trusts, including their purposes and benefits. A Medicaid Trust allows for the assets to be held in trust so that the settlor will qualify for Medicaid and other governmental benefits. If the assets are no longer held in the individual name of the settlor, they are not deemed assets for Medicaid purposes, thus permitting the individual to qualify for Medicaid benefits. Medicaid Trusts must be irrevocable and the settlor is not permitted to receive the return of the principal of the trust. The individual transfers assets to the trust, retaining the right to receive income generated by the trust, with the principal of the assets eventually being transferred to the beneficiaries such as the spouse or children of the individual. Medicaid Trusts protect assets in that the assets will not be required to be employed to pay for long-term care and qualification for Medicaid will result, assuming that the “look-back” period rules (length of time that assets need to be held in the Medicaid Trust in order to disqualify them from use for long-term care expenses) have been followed. Our attorneys will orchestrate the documentation required in order to navigate the “look-back” rules. Life Insurance Trusts have the main purpose of removing the proceeds of a life insurance policy from estate taxes. The trust purchases the life insurance policy insuring the life of the settlor. At death, the proceeds of the life insurance policy are paid to the beneficiary. Like a Medicaid Trust, if the asset (the life insurance policy) is titled in the name of the trust, rather than in an individual name, it is deemed to be an asset that is not included in the estate and is exempt from estate taxes, so long as all events took place at least three years before death. Further, Life Insurance Trusts are useful to raise the money needed to pay estate taxes when the family does not want to sell an asset, such as a family business or farm, in order to raise the money to pay estate taxes. Special Needs Trusts are intended to provide for a mentally or physically disabled individual who may outlive the settlor of the trust. These trusts transfer the assets to a trustee who will manage the assets for the benefit of the beneficiary and in some cases establish a legal guardian who will be the custodian of the everyday needs of the beneficiary. Special Needs Trusts need to be drafted with particular care towards the goal of preserving qualification for any applicable governmental benefits. For instance, language needs to be included declaring that the trust funds are intended to supplement potential government benefits and are not to be employed for basic needs such as food and clothing purchases. These trusts are funded by family members, by life insurance policy proceeds, or by personal injury and malpractice award settlements. A Qualified Personal Residence Trust eliminates the value of one’s personal residence from a potentially taxable estate. This type of trust is permitted under Treasury Regulations as enacted by the Internal Revenue Service. A transfer of the ownership of the primary residence is made to the trust. The individual retains the right to reside in the home for a pre-established period of time, such as ten years; during such time the individual remains responsible for the expenses of maintaining the property, such as real estate taxes and repairs. At the conclusion of the established term, title to the property will pass to the individual’s children free of estate tax and the individual will be required to pay rent at the prevailing rate. Since the individual retained the right to live in the property, the value of the property is also reduced for gift tax calculation purposes. 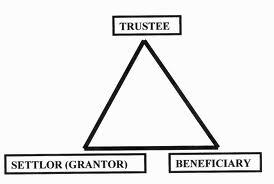 Those settlers wishing to benefit charities could consider Charitable Remainder Trusts and Charitable Lead Trusts. A Charitable Remainder Trust pays income to the donor and/or designated beneficiaries during the donor’s life, leaving the balance to the charity at the death of the donor. This provides for an immediate income tax deduction and for later estate tax savings. A Charitable Lead Trust initially pays the income generated to the charity for a period of time, after which the trust assets are returned to the donor, her spouse or a named beneficiary. Income tax is not due so long as the assets do not revert to the donor and estate taxes can be reduced. Should you have an inquiry as to whether a trust is appropriate for your estate plan and the type of trust to employ, please contact our firm .